Mountain biking is booming in Crested Butte, Colorado. The community prepares to preserve, develop and maintain the largest singletrack trail network in the world. Mountain biking is exploding with 40 Million American riders. The Crested Butte Mountain Bike Association (CBMBA) maintains more miles of track than any other club in the world. Mountain bike tourism in Crested Butte is growing 10%-20% per year and Singletracks.com just named Crested Butte as the mountain bike capital of Colorado. Governor Hickenlooper has pledged $100 million to make Colorado the best state for biking. To keep up, the all-volunteer Crested Butte Mountain Bike Association had to hire its first-ever employee. The sport began in the 1970s in Marin County, CA and Crested Butte, CO. Crested Butte residents tinkered with their bikes, modifying a mix of road bikes, motorcycle parts, junkers, and the occasional bit of flare. They called these creations Crested Butte Klunkers. They didn’t have lofty goals for these klunkers. Instead they were just hoping for something that could handle the potholed main street. The Crested Butte Mountain Bike Association (CBMBA), founded in 1983, is the oldest mountain bike club in the world. Crested Butte and the Gunnison Valley collectively have over 750 miles of singletrack—more than anywhere in the world—and 150+ trails. CBMBA maintains 450+ miles that blanket a 20-mile radius around Crested Butte. The organization relies on an army of volunteers composed of locals, mountain bike pioneers, ageing hippies and visiting riders looking to maintain the trails they return to annually. Volunteers work rain or shine and are rewarded with cold brews and burgers. They’re integral to an organization that has an annual budget of just $20,000 and beer. Mountain biking is the singular summer marketing focus for the Gunnison-Crested Butte Tourism Association. With visiting rider numbers increasing annually and the most trails in the world to maintain, CBMBA couldn’t keep up. It had to get organized in order to fulfill its long term vision—to ride, build, and maintain the best year-round trail network in the world. Subsequently, CBMBA hired in March its first-ever executive director: Dave Ochs. He’s a strikingly handsome fella with really nice teeth, and a penchant for movies about gladiators. Ochs isn’t a Crested Butte mountain biking pioneer or ageing hippie. He’s a former Jersey boy who drove out to Colorado with his dog and serendipitously found Crested Butte. During his first ride on Crested Butte singletrack, Dave thought this place just felt right, and planted roots. He’s the former director of the Crested Butte Chamber of Commerce, an architectural designer, and one of the area’s most fervent and passionate riders. In January, Crested Butte hosted the first-ever Fat Bike World Championships (FBW) sponsored by Borealis Fat Bikes. The festivities included an industry summit, competitive racing with costume-clad riders, free beer, and the branding of one willing participant with the FBW logo. Ochs was the event’s leader and branded the winning open racer on his backside. With his new role, Ochs will promote more events, bringing in much needed revenue for the grassroots organization. Fat Biking brings a whole new set of opportunities—and Crested Butte owns the Fat Bike Worlds. So what’s next for CBMBA and Ochs? Fulfilling and realizing a very zealous and dynamic Long-Term Master Plan full of more trail expansions, lots of reroutes, the cutting out of unsustainable fall line trails and replacing with sustainable, flowy, and rideable track. Needless to say the legions of avid volunteers will be very busy building and repairing trails. Let’s hope there won’t be a shortage of beer. Crested Butte and the Gunnison Valley are the Home of Mountain Biking with 750+ miles of singletrack and 150+ trails. 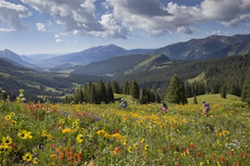 Crested Butte is the official Wildflower Capital of Colorado. Signature summer events include the Original Growler, Gunnison River Festival, Crested Butte Bike Week, Cattlemen's Days, Crested Butte Wildflower Festival and Crested Butte Music Festival. For a full calendar of events click here.